BUDDS CREEK, Md. -- Fans were given quite a show for the opening day at Mayhem at the Creek. Mother Nature smiled on the creek and gave mild weather with a high in the low 80's. All day, racers could be heard speculating on how fast the third round of qualifying might be under the lights. "We are excited with this fantastic weather - combined with the altitude (sea level), we have a legitimate shot to run in the 50's," said Pro X-Treme points leader Brandon Pesz. X-DRL Pro X-Treme record holder Frankie Taylor agreed and backed it up with a 3.61 pass right out of the box in the first round of qualifying. 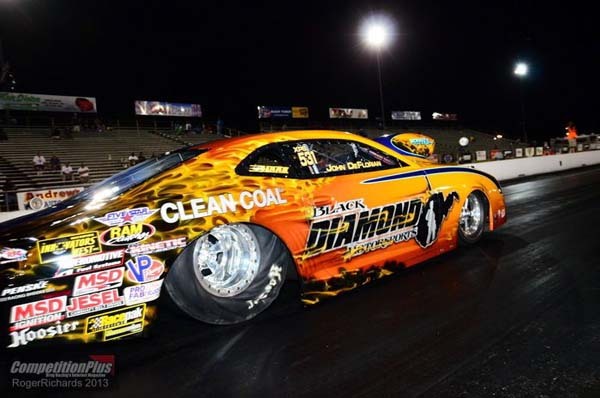 By the third round of qualifying, fans had 3.50's on their mind and they cheered when Terry Leggett "Legbone" posted a career best 3.610 at 206.26 mph. "MIR is my favorite spot to race. It's close to home only five hours, and it's as good a place as I know to race. 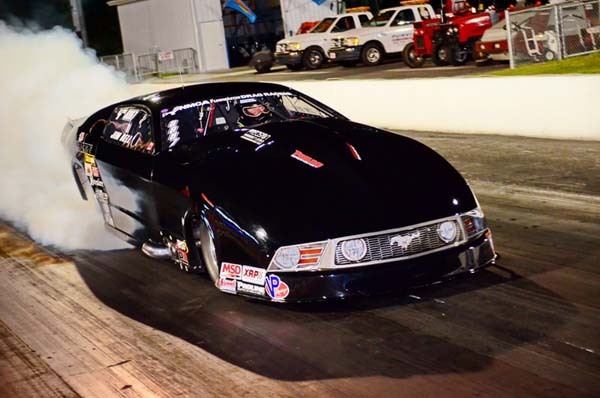 I lost in the finals here in pro stock in 2001, I'm hoping to make it again with a better outcome," said Leggett. But there was more to come as the madman Frankie Taylor took center stage with a shot to break his X-DRL Pro X-Treme record in his final pass for the night. 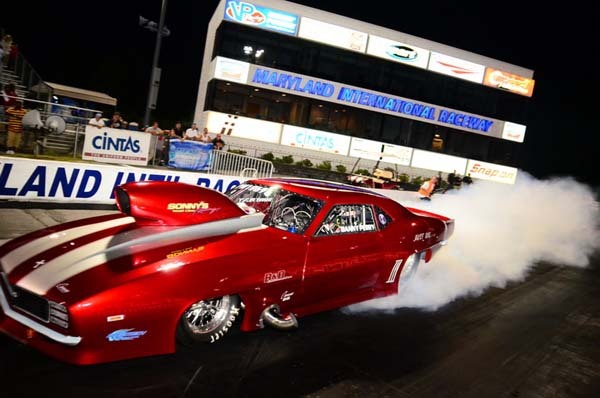 The crowd was rewarded with a 3.604 at 209.01 mph - Frankie didn't disappoint with a new record for the Maryland fans. "The track is great, nice people and an awesome facility. This is my first time to MIR and I really appreciate Royce and his group stepping up to host this event," said the Madman, Frankie Taylor. Not to be outdone, points leader Brandon Pesz burned up the track in the third round with a 3.609 at 208.78 mph to take the win for the X-Treme Gateway Showdown and the second qualifying position. 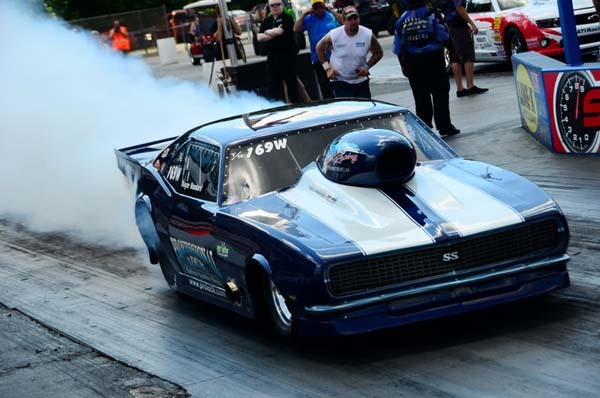 Switzer Dynamics Pro Nitrous driver Jim Laurita found himself in good position at the creek qualifying number two with a 3.866 at 193.21 at the track where he posted his first win as a top sportsman. He will have his hands full with number one qualifyer Danny Parry in his Chevy Camaro who took the top spot with a 3.847 at 197.25 mph. X-Treme Pro Stock drivers watched the weather all day as the barometer rose and mild temperatures dropped throughout the evening. This class is chasing the 4.0 mark and thought they might have a chance when John DeFlorian ran a 4.066 early in the day. However, the humidity picked up later in the evening and the closest he got was 4.049 at 178.10 to take the number one qualifying spot. Jim Bell brought his Ford Mustang to run in the Precision Turbo and Engine Pro Turbo class and posted a 4.155 at 184.45 for his best run of the day. 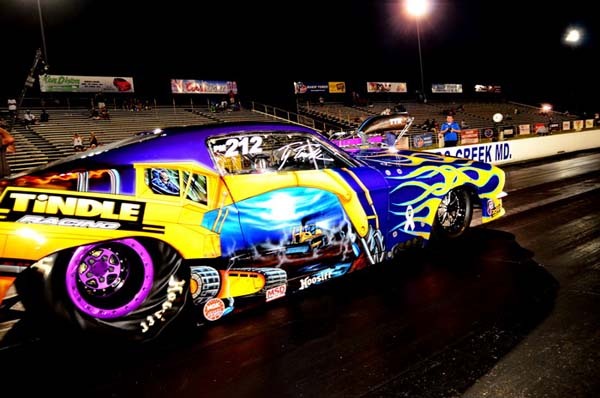 Legbone wasn't the only driver posting a career best as TJ Tindle took the top qualifying position in X-Treme Pro Mod running a 3.909 at 189.12. TJ is having a tremendous rookie season with one win in the series and solid runs all season long. Kevin Rivenbark, also a winner this season, took the number two position with a 3.970 at 168.03 mph. Chris Powers took the top position in Top Dragster with a 4.068 at 173.81 mph. He will be competing for the $500 low qualifier award on Saturday so the final qualifying round should be exciting. Wayne Woodard posted the fastest time of the day in Mickey Thompson Top Sportsman with a 4.179 at 174.21 mph but with $1,000 low qualifier money on the line, everyone in the class will bring their best for the final qualifying round on Saturday. The 10.5 Outlaw class debuted at the Creek and thrilled the crowd with some wild runs and fast times. Mo Hail was the top qualifier for the day with a 4.162 at 180.45 mph. Pro Junior Dragsters ran a competitive class but Logon Hubbell took the top spot for the day with a 7.904 at 82.63 mph. The class has several X-DRL event winners so he will have his hands full hanging on to the top spot and earning the Alert Screw low qualifier award. Weather forecast is favorable for Saturday so we expect more fast and even record-breaking runs as we finish qualifying and run eliminations for Mayhem at the Creek. Final round of qualifying starts at 3:00 pm with eliminations scheduled to begin at 5:00.